Massacre at Wounded Knee Creek. It began with a dance and ended in blood which stained the snows of Dakota. The ghost dance was only a shuffle, but to the Indians it seemed to spell salvation. 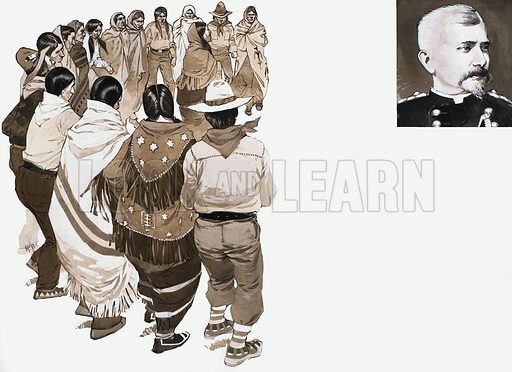 Inset is a portrait of Colonel Forsyth, in command of the army at the massacre in Chief Big Foot's village, of some three hundred Indians, along with their women and children. Original artwork for the illustrations on p4 of L&L no.565 ( 11 November 1972). Available worldwide for immediate download up to 4,694 x 3,409 pixels.